Purity in its most beautiful form: Audi is presenting the new Audi TTS Roadster* and the TTS Roadster* at the Paris Motor Show. The compact two-seater sets new standards in design, drive, and suspension. A particular highlight in the third TT generation is the Audi virtual cockpit. For the first time, the digital instrument cluster provides all information within the driver’s field of vision – a concept that is causing a sensation. 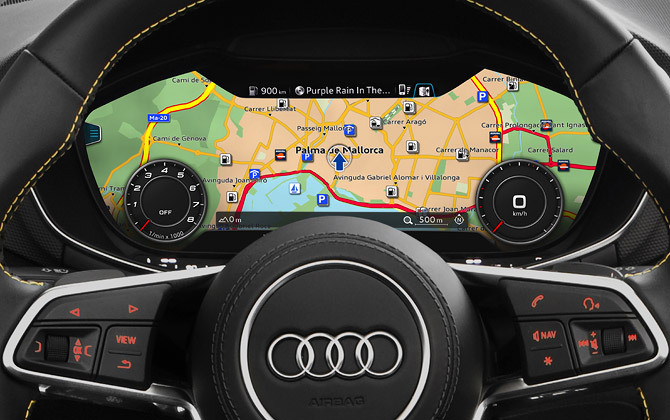 This has already led to the Audi TT’s new display and control system receiving the Car Connectivity Award and the honor of Interior Innovation of the Year at the Automotive Interiors Expo Awards. 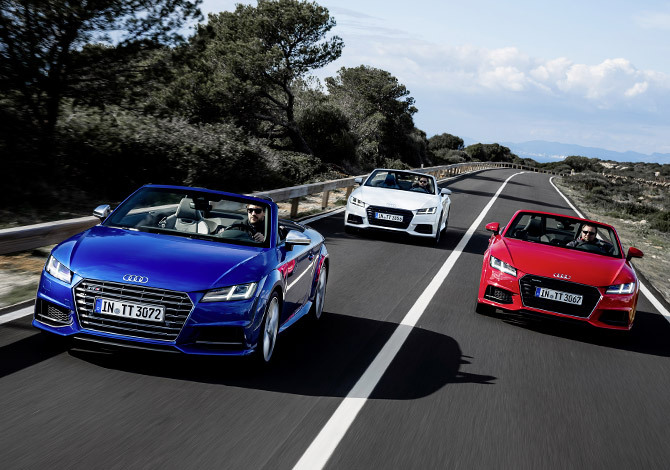 The control system in the new Audi TTS Roadster and TT Roadster is fully focused on the driver. There are two variants of the new multifunction steering wheel available. Thanks to the fundamental redevelopment of the control logic, the reworked MMI terminal features six hard buttons. The natural language control also makes it easier to operate the system when driving. 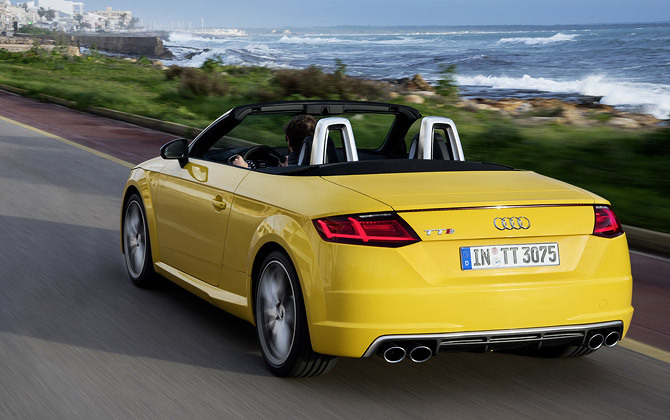 The new TT Roadster combines the dynamic ride of a sports car with the driving experience of an open‑top two‑seater. The basis for this consists of struts in the underbody and body that considerably improve both the torsional rigidity and the ride comfort. As with all Audi Cabriolet models, the new Audi TT Roadster and the Audi TTS Roadster also feature an electrically actuated fabric top. This is available as standard in black, titanium gray and jive, and fits perfectly into the design line. With parts made from magnesium, aluminum, steel and plastic, the soft top weighs just 39 kilograms (86.0 lb) and is 3 kilograms (6.6 lb) lighter than its predecessor. This has a positive impact on the gross vehicle weight and the center of gravity of the open‑top two seater. 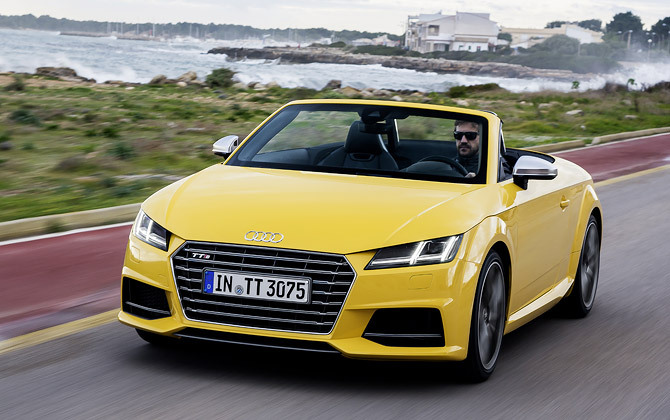 The body of the TT Roadster and the TTS Roadster represents a new evolution of the Audi Space Frame (ASF) based on the modular transverse matrix (MQB). Ultra-high-strength components made from hot-shaped steel reinforce the front section and the passenger compartment floor. The passenger compartment and all outer skin and attachment parts are made of the classic semi-finished aluminum products cast node, extruded profile and sheet metal. The new TT Roadster is being launched with two turbocharged four-cylinder engines, a TDI and a TFSI. A powerful TFSI ensures efficient drive in the TTS Roadster. With power outputs between 135 kW (184 hp) and 228 kW (310 hp), they clearly surpass the respective predecessor engines in terms of power, while significantly undercutting them with regard to consumption. 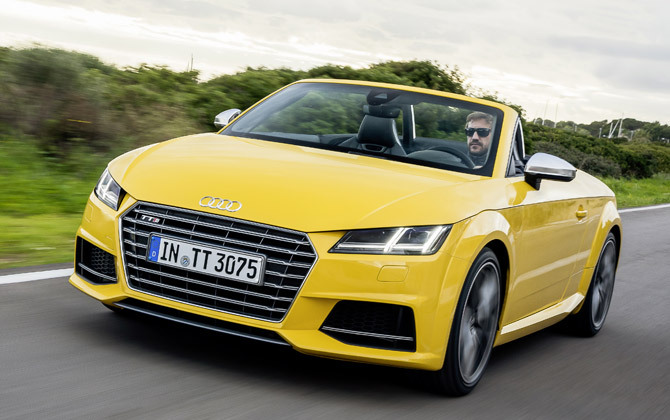 The quattro permanent all-wheel drive has been fully redeveloped; it is optionally available in combination with the 2.0 TFSI engine in the TT Roadster and is fitted as standard on the TTS Roadster. During regular driving, its electrohydraulic multi-plate clutch optimally distributes the drive torque between the front and rear axle depending on driving conditions, road characteristics and driver type. The McPherson principle is used for the front suspension of the new Audi TT Roadster and the TTS Roadster. Aluminum components reduce the weight of the unsprung masses. The steering rack of the standard progressive steering is designed so that the steering ratio becomes increasingly direct when turning. The rear axle, which features four steel links per wheel, can handle the longitudinal and transverse forces separately. The two-seat interior of the new TT Roadster and the new TTS Roadster fits around the driver like a custom-made suit. It has an intimate and protective feel, particularly when the fabric top is closed, without ever being restrictive. The curb clearance is high and the newly developed sport seats with integrated head restraints are mounted low. Together, they weigh five kilograms less than the seats in the predecessor. The S sport seats are optionally available (standard in the TTS Roadster) and feature particularly powerful, pneumatically adjustable bolsters. The new Audi TT offers a far more distinct and varied range of colors than its predecessor. There are 11 exterior colors, one of which is exclusively for the S line. Seven of the colors in the palette are new for the TT, and two of these are completely new for Audi: nano gray and tango red. Panther black, crystal effect and the expressive Sepang blue are also available for the TTS. 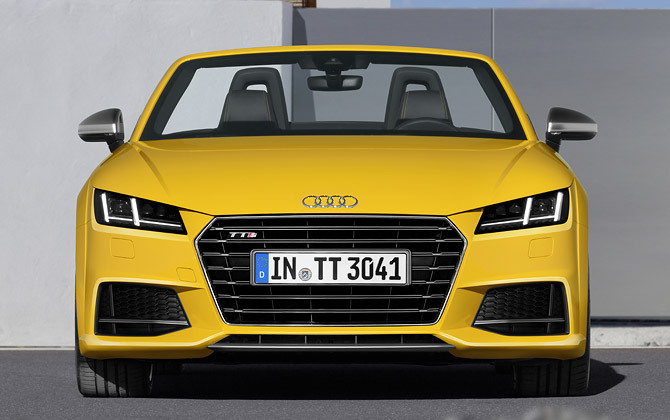 In Germany, sales of the new TT Roadster will begin with the Paris exhibition in October 2014; the TTS Roadster will follow at the start of 2015. The basic price of the 2.0 TFSI is €37,900. The generous standard equipment, which includes xenon plus headlights, air conditioning, and the MMI radio, can be expanded with numerous pieces of sporty, practical, and convenient optional equipment.